Ensuring Long Tool Life is All About Set-up! Are you experiencing punch failures on a regular basis? American Punch has the answer to your problem. 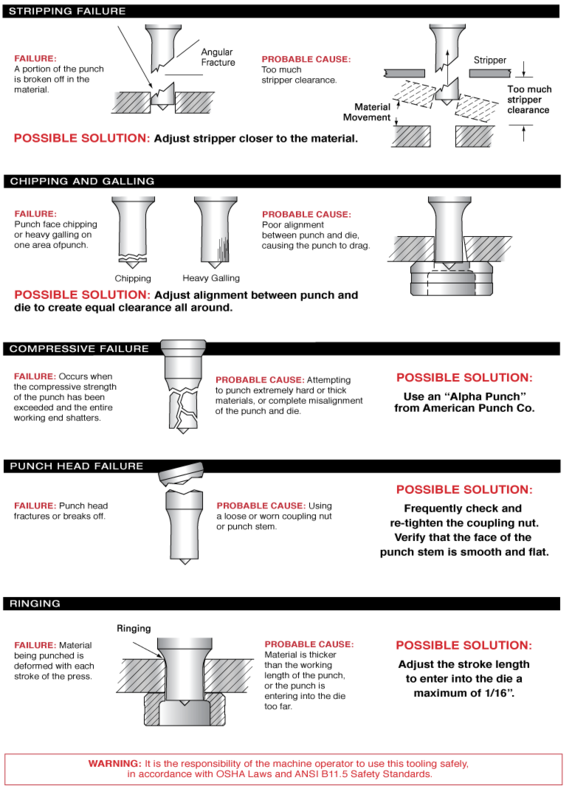 Thanks to our years of working with fabricators, we know all the common – and uncommon – reasons for punch failure. Some are listed below, along with the likely cause and a potential solution. For an in-depth analysis, send us the broken tools (regardless of the manufacturer), and slugs of the material being punched. We would be glad to make recommendations that will improve the performance, and safety, in your plant. You can also contact us by submitting this simple form or by calling 800.243.1492 to speak with a knowledgeable staff member. Copyright © 2016, American Punch Co.